Is There More To The Samson Expedition XP40iw PA System Than A Portable Design? 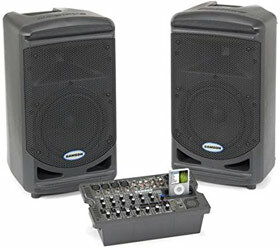 While it may seem rather small and simplistic at face value, the Samson Expedition XP40iw Rechargeable Battery Powered Wireless PA System has enough features and accessories to make it quite an interesting prospect for anyone that wants a small sound system for the garden or simple amplification at small events and gigs. The inclusion of the rechargeable battery, microphone and speaker stand will be the immediate plus point for many prospective buyers. On top of this, it is the 40w Class D amplifier, 6 inch woofer and numerous jacks and controls that shows that there should also be some power and quality within this little product. Does The Samson Expedition XP308i PA System Do Enough To Impress Performers Of All Kinds? 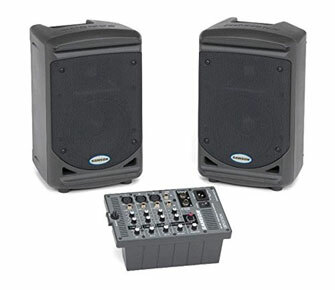 The Samson Expedition XP308i 300-Watt Portable PA System has an impressive sounding specification including dual 2-way speakers, two 150W lightweight Class D amplifiers and 8” and is advertised as being compact and portable while also offering a great sound. 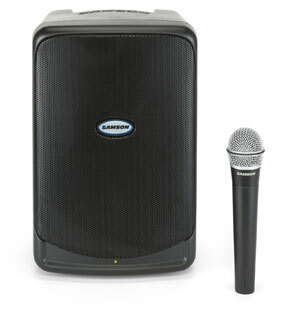 According to Samson, this is the “ideal single system solution for a variety of live sound applications”. This, combined with the range of features and numerous inputs, leads buyers to believe that everyone from acoustic performers, public speakers and full bands could use this with great success. This makes the XP308i sound like a truly versatile product but what is it really like?